Gigantes Islands, Iloilo — over the recent months, this has become a favorite tourist attraction in the Visayas Region. Gigantes islands, also called Islas de Gigantes, is an island chain about 2 hours away from Estancia Port. Gigantes islands used to be a secret. Now, there’s a ballooning number of travel packages offering island hopping in Gigantes islands in various social media sites. According to Philippine Daily Inquirer, during the Holy Week vacation in 2013 there were 100 visitors to Gigantes Norte and in 2014 this has increased to 500. I guess it’s safe to assume that this is just the start of solid tourism in Gigantes islands. Typhoon Nona had just landed in the country when Hali and I arrived in Iloilo, so on the day of our island hopping, the sky was enveloped with clouds. There was intermittent rain, and sea waves were stronger than usual. 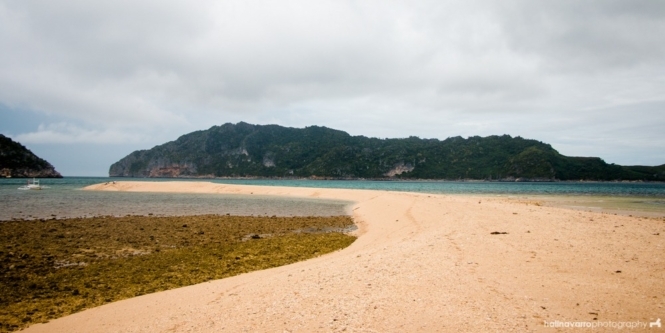 Our first stop for our island hopping in Gigantes islands is the Bantigue sand bar. The sand bar here isn’t flat like the others we’d been to, and its shape shifts depending on the weather and flow of the sea. Rockies at Bantigue sand bar. There really isn’t much to see here, but it’s a good-enough place to pass away the time while we wait for the high tide, so we could splash in Tangke Lagoon. There are residential houses in the island where you can buy fresh scallops for as cheap as P1 each. Cabugao Gamay is the icon of the 10 islands in Gigantes Islands, Iloilo. On a good summer day, the colors of the sands and the deep green of the coconut trees are in a beautiful contrast with the blue of the sky and the aqua waters surrounding the island. Even now, I have ambiguous feelings about Cabugao Gamay. It looks postcard perfect, no denying that. But in person, it looks exactly as it does in photos — small. 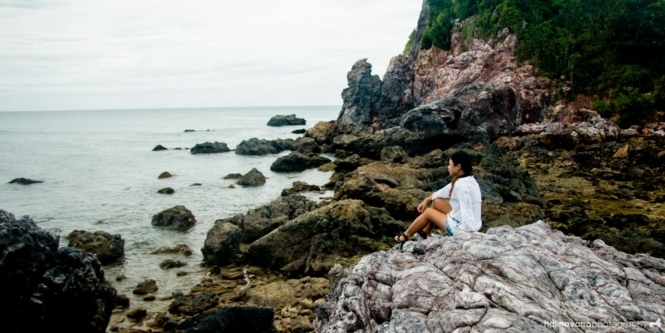 The view from the cliff is the best spot for taking photos, as it overlooks Cabugao Gamay. What you see in the photo is all there is to explore. Cabugao Gamay, the icon of Islas de Gigantes. Cabugao Gamay is still beautiful despite the gloomy weather. Hali has visited here the year before, and during that period various additions had been made. The cliff is more accessible, with wooden stairs and fences, whereas before there was only a rope for climbing up the cliff. Hali thinks these additions, although good for security and commercial tourism, somehow lessens the used-to-be raw charm of Cabugao Gamay. Because the waves were getting stronger, our tour guide, Kuya Nonong, decided to take us in Tangke Lagoon, even though it wasn’t high tide yet. During high tide, water flows inside the lagoon, filling it up with light-green brackish water. On the occasional times that the water gets high enough, the water is a clear green. On other times, such as this one or during Hali’s past visit where it was waist level, the water is cloudy. Since it was habagat season, it was difficult for boats to stay put and properly dock so we could enter inside the lagoon. Kuya Nonoy had to pull me up while our boat was rocking sideways. During high tide, the water rises up inside Tangke saltwater lagoon, creating a natural pool. There was almost no water in the lagoon. I suppose getting to swim is a matter of luck, dependent on the fickle-minded weather and season. The lagoon is enclosed by towering karsts. There’s also a path on the right of the entrance for cliff jumping, perhaps about 40 feet high. Hali, the adventurous spirit that he is, had to give it a go before we left Tangke Lagoon. The last leg of our island hopping was Antonia Island. This island is virtually similar with Cabugao Gamay, except that there’s a resort in here. Many of the coconut trees in the island were destroyed by the last typhoon. At the snorkeling area, where fishes turn vengeful when disturbed. There’s a snorkeling area in the beach in Antonia Island, marked by a rope. We did not snorkel, as I doubt there would be enough visibility given the weather. Instead, we swam for a bit and I was pecked twice in the leg by what we assume is a disturbed fish. Hali caught it on cam and, to my chagrin, thought it very funny. 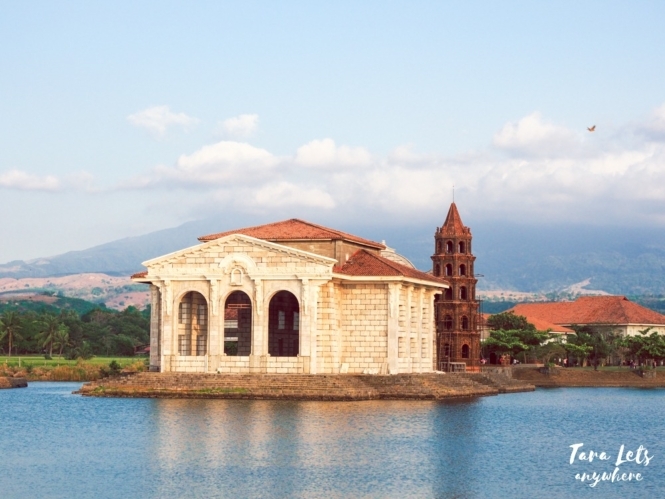 You can do island hopping on your own or via a travel and tours agency. 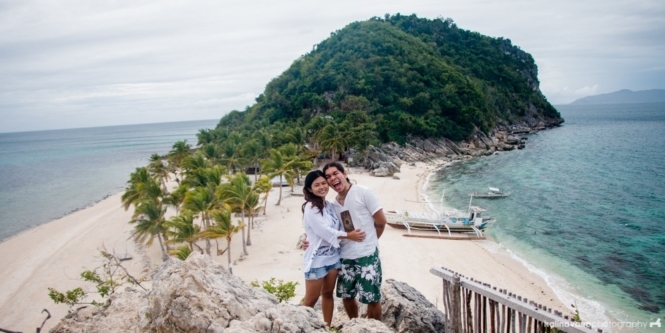 We’d decided to avail of Gigantes Hideaway Tourist Inn’s 3D/2N tour package for 2 people. Although there are cheaper packages nowadays, I’d settled for this one because of numerous positive recommendations from fellow backpackers. You can stay overnight in one of the resorts in Gigantes Islands or camp in Antonia Island for P200 per person. The resort also provides jet skis for about P3500 an hour. The best time to visit and do island hopping in Gigantes islands is during summer, which coincides with the peak season. P.S. 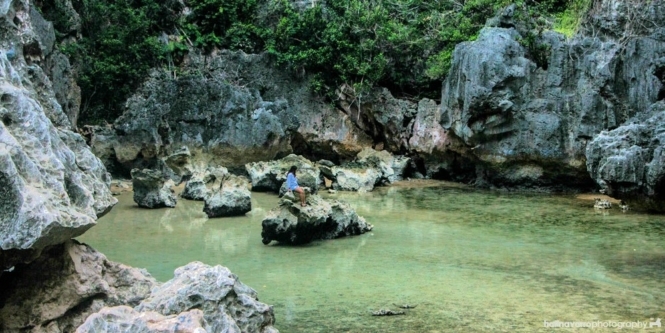 This post on Gigantes Islands, Iloilo, is part of our 5-day Antique-Iloilo-Guimaras trip. See other places we’ve been to in this trip. My Pinay Love of my Life and I will be visiting soon. Cannot wait.